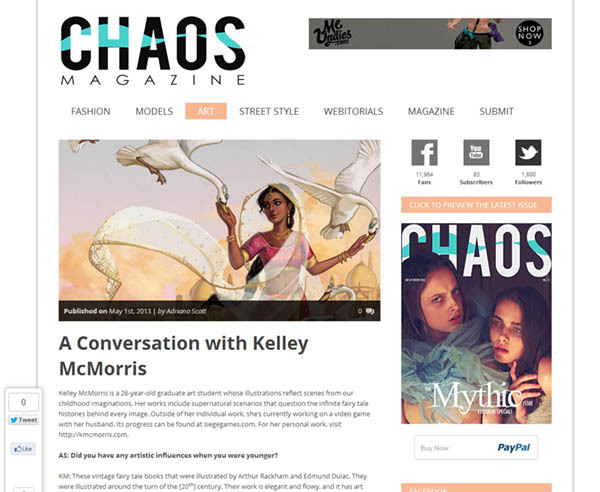 Lookit me, I have an interview just published in Chaos Magazine, an online art and fashion magazine. I had a one-hour Skype session with the author, Adriana Scott, and she asked me a lot about my influences and childhood. It was fun, and made me think more about my own artwork. One of the first things Adriana said to me was that my work doesn't really have a dark edge to it. "It's very whimsical," she said. I laughed, because it's true. Perhaps because I had a very happy childhood, I just don't really feel a need to express any inner angst through art. How very un-artist-y of me, right? At the same time, I don't want to draw all sparkly butterflies and rainbows all the time. (Although, yes, that's basically what I did when I was little.) I want my illustrations to generally feel charming and inviting, but also grown-up enough to be intriguing and unique. Never cliche or expected. That's my goal, anyway.